Today we remember the life and work of Dr. Martin Luther King Jr.
Rather than present secondhand analyses or interpretations, the New Existentialists will let the work of Dr. King speak for itself. We direct you to some of the following links to read some of his writings and his correspondence, as well as watch or listen to some of his talks and speeches. Of course, his most famous speech, “I Have a Dream” from August 1963, is always an excellent place to start. 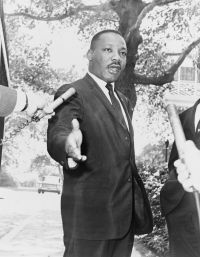 The website for The King Center for Nonviolent Social Change, established by Dr. King’s widow, Coretta Scott King, provides both biographical and historical context as well as links to an extensive digital archive. If you have children and would like to introduce them to Dr. King, the Library of Congress has created a website called “America’s Library” that includes a brief biographical sketch appropriate for many schoolage children. Additional documents, papers, and video links can be found at the website for the Martin Luther King Jr. Research and Education Institute. May Dr. King’s legacy help us all to be inspired to create a better, more compassionate world where once and for all, we restore human dignity.